John is one of the two Founding Partners and Senior Partners of KATS. He is also the Firm’s Managing Partner. His experience spans over fifty (50) years practice in Uganda and the East and Central African region. In his career, John has been involved in any and everything that has to do with law and legal practice in Uganda. Ask any judge or legal practitioner and with unanimity, they concur that without doubt John is one of the finest lawyers in the country’s history. John had the unique distinction of being the youngest student in his class pretty much throughout his academic career, while at the same time excelling as one of the best students in his classes, winning numerous awards along the way. John graduated top of this distinguished law class and was awarded full African Fellowship Scholarships to study his Master of Laws (LLM) at either Oxford University in the United Kingdom or Harvard University in the United States of America. He chose Harvard and became one of the very first Ugandan graduates with an LLM from that elite institution. John has lectured law at Uganda’s premier tertiary institution, Makerere University, teaching ‘Introduction to Law’ and the ‘Law of Business Associations’ throughout the 70’s. He has authored many a learned treatise including ‘The Law of Business Associations in East and Central Africa‘ which is one of the leading texts in all the law schools across East and Central Africa. The 2 students he selected to work as his research assistants on the book were John Patrick Amama Mbabazi – who went on to become the Prime Minister of Uganda, and John Sentamu – who went on to become the Archbishop of York in the United Kingdom. He has also served as an external examiner for the Universities of Dar-es-Salaam, Zambia, Malawi and Nairobi for several years. His distinguished career in the academic field is rivalled by equal merit in the practice of law. He has been involved in a lot of groundbreaking and law-creating litigation that has significantly contributed to the evolution of jurisprudence and legal practice in Uganda. Outside the courtrooms, John has been involved in the structuring and planning of many of the largest commercial ventures in Uganda and he continues to routinely advise leading commercial concerns in Uganda on a day-to-day basis. He has over the years developed expertise in the areas of Corporate and Commercial Litigation, Mediation and Arbitration, Corporate and Commercial Law, Capital Markets, Banking & Finance, International Trade, Mergers & Acquisitions. He has served in various capacities as a Director or as Chairperson of the Boards of several large domestic and multinational corporations. For over thirteen (13) years, John was the Honorary Attorney General and Chief Legal Advisor to the Kingdom of Buganda and to His Majesty the Kabaka of Buganda. 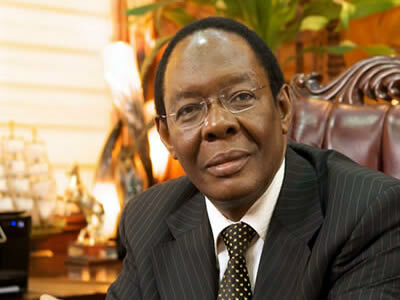 He was also the Chairperson of the Buganda Constitutional Review Commission. John was honoured to have sworn in the King of Buganda, His Majesty Kabaka Ronald Muwenda Mutebi at his coronation on 31st July, 1993. John was awarded ‘Ekitibiwa ky’Amafumu n’Engabo’ by the Kabaka of Buganda in 2011 for his outstanding contributions towards the kingdom. This is the highest honor that can be bestowed for service in the Kingdom of Buganda. On the 31st March, 2017, John was recognized by the Uganda Law Society (ULS) and awarded the ULS’ first ‘Distinguished Service Award‘ at the Uganda Law Society Annual General Meeting held in Entebbe, Uganda on the 31st March, 2017. He was also, one of the first 3 lawyers in the history of Uganda to be inducted into the ULS inaugural ‘Roll of Honour‘. This award is given to lawyers who have distinguished themselves in the profession, have a proven track record of being excellent attorneys with stellar reputations and have also made significant contribution to jurisprudence or contributed to the development of a particular area in law. On the 28th March, 2018, John was awarded the Special Rank of Senior Counsel (the highest honor in the legal fraternity) by the Chief Justice of Uganda, Hon. Bart Katureebe. In the 2017 Edition, it was observed that he is well regarded by his peers, who laud his “incredible” profile in the market. He is a seasoned corporate and transactional lawyer. In the 2016 Edition it was noted that he is a highly regarded and distinguished practitioner with a wealth of experience advising on corporate transactions and financing. In the 2006 Edition, ‘Big ideas man’ John Katende was praised for being ‘exceptionally strong’ in corporate and commercial transactions. In the 2004-2005 Edition, ‘Extremely shrewd’ Partner John Katende is highly regarded for his expertise in company law matters in Uganda, being the author of the leading textbook in East African Law Schools on company law. His clients include a number of foreign investors establishing and registering enterprises in Uganda. He is also an honorary Attorney General and Chief Legal Advisor to HM King Ronnie of Buganda. In the 2000 – 2001 Edition, it was noted that; John Katende has been involved in a lot of ground breaking and law creating litigation and has contributed significantly to the development of the law and its practice in Uganda. Outside the courtrooms, he is a leading practitioner in areas relating to business corporate and commercial law. He has been involved in the structuring and planning of many of the largest commercial ventures in Uganda and continues to routinely advise leading commercial concerns in Uganda on a daily basis. In the 2019 and 2018 Editions of the IFRL 1000 – Guide to the World’s Leading Financial Law Firms, Mr. Katende is ranked as a ‘highly regarded‘ lawyer. In its 2017, 2016, 2015, 2014, 2013, 2012, 2011 & 2010 Editions, he is ranked as a leading transactional lawyer.